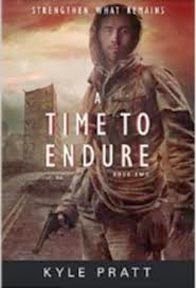 A Time To Endure is the second book in author Kyle Pratt's Strengthen What Remains series. It catches us up on the life of Major Caden Westmore, after he manages to escape the nuclear attack on Washington D.C. and other major American cities. When we last left Caden (in the first book, Through Many Fires), he had made it back to his hometown in the Pacific Northwest, reconnected with his parents on the family farm, and established command of the local armory. He battled through civil unrest, working through the conflict between the military and local law enforcement, and contemplated how his town, family, and country would navigate the post-attack years. Caden wonders how it will all play out, and what effects it will have on his family. Would some sense of law and order return; what about a Constitutional government? Would America ever be the same, or was it destined to be divided into factions, fighting each other and foreign countries ready to take advantage of the chaos? Well, in this second book, the title aptly describes what Caden's life is all about ... enduring. His focus is also widening. There is a provincial government with a dictatorial president, all too eager to cut a deal with the Chinese to carve up America. Caden finds himself stretched thin -- between trying to restore law and order within his community; dealing with American soldiers fighting each other and the civilian population; and confronting the increasing problem of gangs like MS 13, who have begun to infiltrate his community. On the personal side, Caden is determined to search for his brother, Peter, who was a law enforcement officer on duty when the nuclear bomb hit Seattle. We are also introduced to Zach Brennon, a hard-luck kid who Caden takes under his wing. Zach knows the ways of the woods, and finds himself caught in the middle of a war between the Mexican gang, the military and civilian authorities. Kyle Pratt weaves his plot effortlessly, giving us plenty to think about in the process. Furthermore, his tale is a cut above the spate of survivalist novels that have become a popular form of literature these days. If you're looking for a quick read that (I believe) accurately depicts what our future might look like, then I recommend you look into this engaging series. Valley Food Storage. If you're like me, the supply of canned goods you began storing at the first hint of a national crisis have long been outdated. And the choices of freeze-dried foods have left your palate wanting more; besides the fact that preservatives were often the first ingredient listed on the packaging. 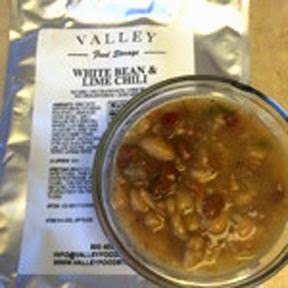 But, I'm happy to report that the owners of Valley Food Storage were kind enough to send me a sample package of their White Bean & Lime Chili, and I was pleasantly surprised at, not only the flavor, but the consistency of the finished product, and the healthy ingredients. You know how most freeze-dried food lacks quality flavor or seasoning? Well, this product is about as close as I've seen to home-cooked food, right off the stove. The ingredients read like a recipe out of your favorite cookbook: Great White Northern Beans, pinto beans, large sliced onions, sea salt, garlic, red and green bell peppers, cumin seed, chicken broth, black pepper, lime juice, cilantro, jalapeño pepper, and cayenne pepper. Only the Xanthium gum and Citric Acid tell you it has been prepared for a long shelf life --- the company claims up to 25 years! Plus it is Gluten Free!! Valley Food Storage's selections are a little more exotic, with names like Irish Pub Cheddar Potato Soup, Mango Habanero Chili, and Sweet and Sour Asian Rice. If they taste anything like the sample I tried, you won't mind eating survivalist food. And I imagine that adding rice or meat to any of the selections would enhance the dining experience. Price-wise, they are in line with other products in the marketplace. Try a sampling or two, and see what you think. I think you'll agree they're a cut above the rest. FiberFix. After seeing this product on Shark Tank, my husband had an occasion to use it in his art studio. One of the legs of his favorite chairs broke one day, and he was on the verge of discarding it, when he remembered this product. After what turned out to be an easy application, the chair is as sturdy as new! And that got him to thinking .... this would be a great thing to have when the SHTF. 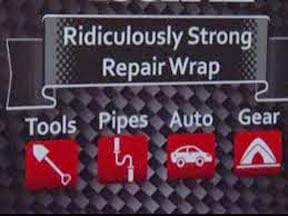 Just think of all the uses ... tools could be repaired; it could provide a barrier for busted water pipes; it's a heat wrap for up to 850 degrees. Let's face it ... all kinds of implements and materials will become more valuable when it is TEOTWAWKI-time. We won't be throwing anything away, and any means by which we can repair broken items could literally be a life-saver. Just think of all the possibilities .... tent poles, shovels, ax handles, furniture ... the list is endless. The product is comprised of a special waterproof resin, and has the added benefit of being heat, cold, and impact resistant. Which got PLW to thinking .... since it appears to be made like a fiberglass cast, and must be soaked in water before applying, he wondered if it couldn't be used in an emergency to help form a cast for a broken arm or leg. Of course, it would need to be investigated further to make sure there were no side-effects from accidental contact with your skin. But, from all appearances, this product is ideal for any number of survival applications. You can even buy it in a combo pack of various sizes. It is advertised as 100 times the strength of duct tape, and I have a feeing it will become a staple among Prepper inventories. So, there you have it ... just a few things to add to your Survival storehouse. I am happy to recommend all three, having used and approved them all in our household. You can never have enough options, can you? It's a good idea to educate yourself on how to endure until the day our Savior returns, and you never know when you might be able to use them in your service to others. Ezekiel 38:7 "Be ready and keep ready, you and all your hosts that are assembled about you, and be a guard for them."